NOTE:Tangrowth enabled for quest and off from team is needed for this part, then talk to the thieft in the first house at Blackfell. Objective: A disputed treasure needs to be set right. Tips: The item Banette stole is it's mega stone. When you give the item back to the burglar he reveals the mega stone was going to be given to the person that rescued the zombies (you) but he won't give it back as long as he's awake. At nighttime you can take it off of the table and claim the Banettite for yourself. Last edited by ChilenoEnDinamarca on Sun Jan 14, 2018 9:53 pm, edited 1 time in total. Objective: You`re hired! Go rescue the girl! Tips:Tangela can be found in Darlinghurst town. 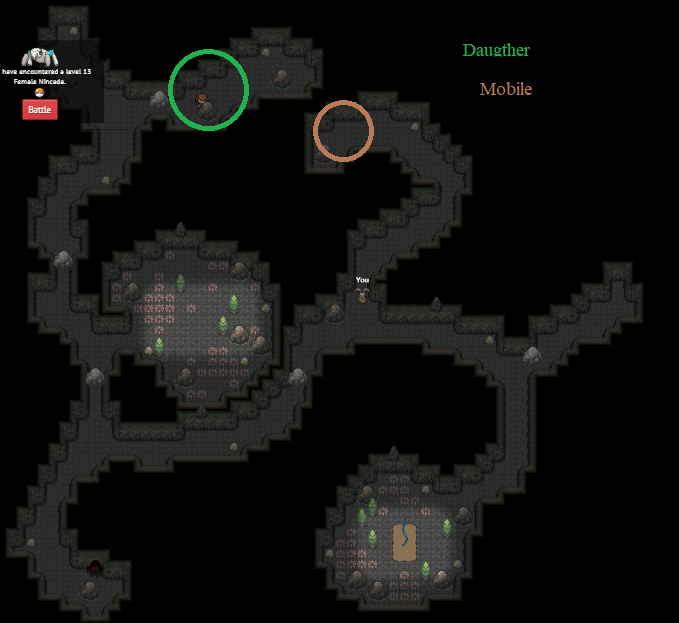 There is a dark-type move tutor in the Blackfell cave. Sometimes when you destroy a rock there is a level 75 pokemon hiding in it. Objective: Gather materials for Scientist: Strange Gyarados DNA (from the skeleton), Geode and a Magikarp NOT-originally owned by you. Solution: Geode is a Rare drop from Geodude, The DNA is from the skeleton on the Undersea Path 1 and magikarp from another user (Of your team, trade, etc and remember to enable it for quest). Once you have all those items, you must go to the secret Den at the north-west on the route 12 (It is inside a big tree). Once inside talk to the scientist and he will start an experiment. Now we will be able to choose 1 of the two options... I took the one with ''rescue the magikarp''. Now go to Strongwater's Poke-market and talk to the scientist inside and buy the ''Useless stone'' for 1000 coins. Now go outside and head to to the bridge, interact with the magikarp on the ground and you will obtain the ''Mega-Stone''. Solution: Start this quest by talking to the Sorcerer on the house to the left from the pokecenter at Bluegum Town. We must now go to the Bluegum caves at route 1, once we are there we will have to interact with this rock (Click here). Follow this path (Click here) until you reach a lather. Pick up the item and you must defeat dusknoir many many times. Once we are done, let's go back to the sorcerer at Bluegum town. Location: hey wats dat behind u? How do I Find the quest giver the ilegal team maker ? nvm I completed it .-. oof note that in the cave with the dead ghost guy, if you dont go the right way some "Mysterious voice" will bombard you. Por si las moscas, aquí esta la traducción de la guía de los legendarios al Español.